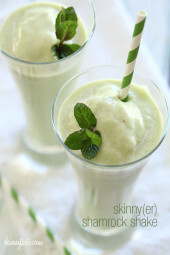 If you’re looking for a quick an easy summer dessert under 100 calories, look no further! Nothing says summer like biting into a juicy peach. Grilling them is a simple way to enjoy them as a dessert, a perfect ending to a backyard BBQ without heating up your kitchen. Delicious topped with yogurt and honey, but also great topped with low fat ice cream. How much is 1/3 of the peach? You cut the peach in half and it makes four servings. The nutrition shows serving size as 1/3 peach? Typo, it’s for 1/2. Of course, you can eat the whole peach if you wish. This is one of my favorite treats! I like to serve mine with Halo Top Vanilla Bean Ice Cream instead of yogurt. To die for! I tried to make this and couldn’t seem to “pit” the peach? I cut it half and proceeded to pull and I just ended up smushing my fingers into it. Any suggestions?? Why is this listed in the low carb section?!? omg i just tried these and they are divine! Tried them tonight and they were superb! Thank you. I'll be adding them to salads too as suggested by your readers. Just lost 25 lbs. It's gonna be a good summer! I am not a fan of Greek yogurt either and I will be using the frozen yogurt. When do I add the cinnamon and is it still good without it? We FINALLY got a grill (happy dance!) and I'm totally hooked. These beauties are up next! I made them with plain greek yogurt inside on a grill griddle, they were amazing. I use my George Forman grill. About 3 minutes does the trick! I don't have a grill, we live in an apartment. Do you think I could get away with roasting these in the oven instead of grilling? 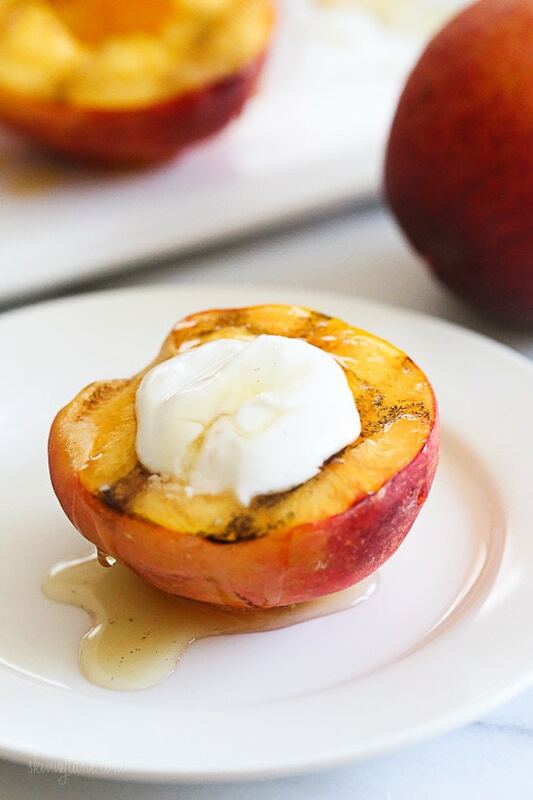 Should you point the yogurt/honey and then serve the peaches immediately after grilling them? I, too, would like to know how to convert the grilling to maybe oven broiling or in a skillet perhaps? Please advise. I am seeing lots of yummies I'd like to try from your site. You can make them on a grill pan indoors. I don't have a grill, but I'd love to make these. What's the best way to modify for a stovetop/ oven? did you oil the grates? 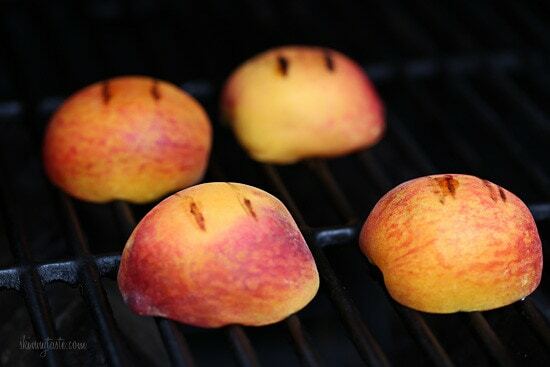 the peaches stuck to the grill for me. still tasted great though! I used pure maple syrup in plain yogurt instead of honey/greek yogurt. Yum! Oh my goodness, these were so good! 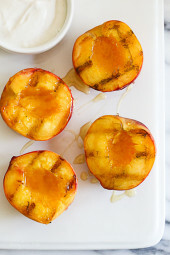 When Publix mentioned grilling peaches & didn't suggest a recipe, I Googled "grilling peaches" and your recipe came up. I grilled them tonight, a first, and my husband & son loved them. I can not wait to try this recipe with company. I'm going through the rest of your site right now. Thank you! I picked up peaches at the farmers market this weekend. 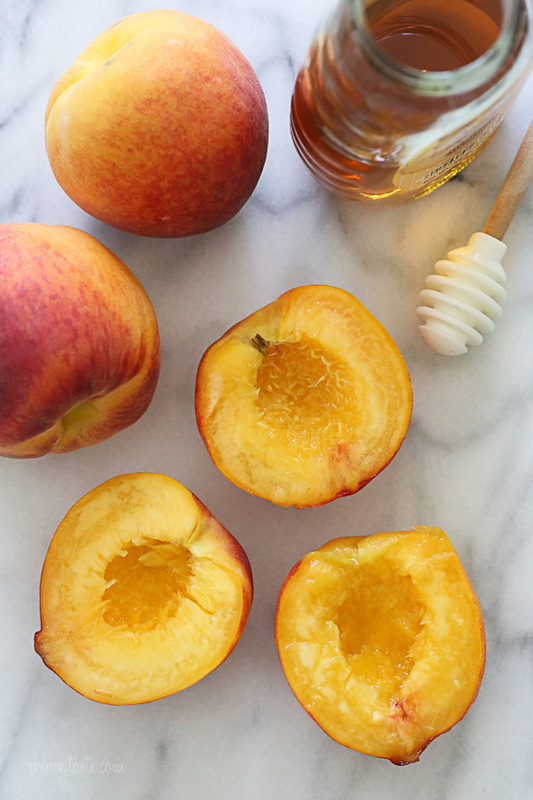 After making this recipe, I think I might have to pick up peaches every weekend! Grilling the peaches makes them so sweet, you almost don't need the honey. Gina – well done, yet again! I love peaches! What is the points plus on this one? Looks amazing. I will for sure be giving these a try. These were amazing!! I have made 5 of your meals this week….I LOVE your site! Thanks so much for all of your hard work. I have forwarded to so many people this week. Thanks again Gina! Made these tonight and I couldn't BELIEVE how decedant they tasted! 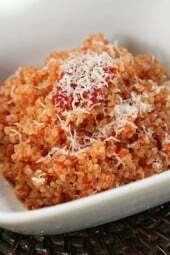 I just descovered your site and I've made your recipes the last three nights and they've all been amazing! LOL, Oh how I love peach pie!! Made this last night. I didn't print off the recipe and i used plain yogurt and I put vanilla bean extract and cinamon in the yogurt. Really yummy. Thanks for stopping me from making a peach pie!!! Thanks for the idea of adding vanilla extract to the yogurt– will do! You could always use plain yogurt or frozen yogurt if you don't like Greek yogurt. This looks so good! What a perfect summertime treat! My mouth is watering! However, I can't stand the texture and taste of Greek yogurt when it's all by itself. Is the taste mostly un-noticable…ie the chalky, gritty feel? love it… can't wait to try. @What's Blooming – I'll have to give that a try this week! Did you peel the skin off the peaches? In your picture it looks like one is peeled but not the other one. I'm definitely going to try these soon! Thanks for posting! They're not peeled – they're cut in half. 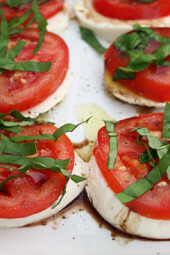 Hi Gina – I also add grilled peaches to a lettuce salad with blue cheese. Delicious. Also delicious over mesclun greens with a little cilantro, goat cheese, crushed peanuts and thai dressing. Yummm!